Join the library and learn about our closest neighbor in outer space: the moon! We can observe the moon almost every night, just by looking up into the sky. On Friday, April 12 the library staff will have several telescopes set up outside to view the night sky. This free event is for all ages and will include a special pajama story time and craft time for the younger children. Our STEM activities for older children will include determining moon phases and learning about the moon and surrounding stars. 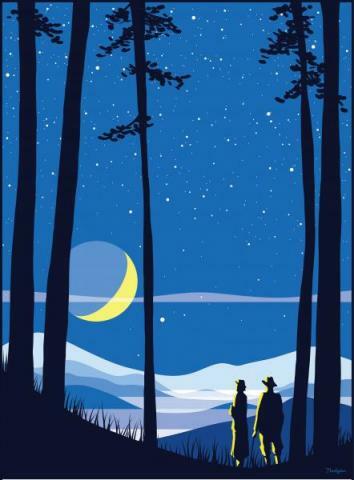 Americorps intern from Balsam Mountain Trust will be leading activities, such as Oreo cookie moon phases, and will read books about the phases of the moon. They will also have a discussion of nocturnal animals and how the moon affects animal behaviors. She will be bringing a live animal from our local region as part of the discussion. In case of inclement weather, we will host the event in the library auditorium with a discussion and a video/slide show.